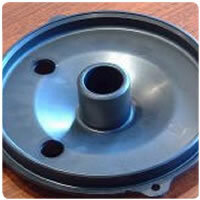 Precision Injection Mold Making for Auto Sector Parts - Best North American Auto Parts Mold ManufacturerProtoplast Inc. 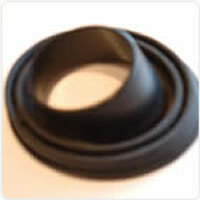 This part is mounted on the clean air housing of GM’s sport utility line and was prone to failure because the original seal was a die cut foam gasket. Servicing problems emerged in the aftermarket and GM demanded an engineering change. Turning to Protoplast for suggestions GM and Protoplast worked together to achieve this new design. One challenge: making a hose mounting and an integral seal was solved by Protoplast using its knowledge base to suggest that the answer lay in overmolding a seal to the base of the mount. Another challenge was to mold a soft seal that would not detach from the rigid base. We solved the problem with 35 shoreA durometer TPE. The end product not only met the specifications needed by GM but also the overmolded material was approved for use by GM’s materials division. Protoplast being the first company to gain such approval. On the Lincoln Navigator, the running boards extend outwards when the car is stationary and stored inboard for traveling. The boards are moved by a rack and pinion gear inside a housing mounted immediately behind the front wheels. The gear assembly housing cover is fitted to the end of the gear motor housing. The rotary movement of the actuator is governed by sensors. These sensors mount in thru-holes and require a precise geometric placement. The challenge for Protoplast was the high tolerance demanded in the final specifications, plus or minus .002″ on the major diameter and the inside mounting boss and the geometric location of the sensor holes in relation to the datum was critical. To meet this challenge Protoplast manufactured an asymmetrical die so that the different thicknesses of the cover on both sides would shrink to the correct finished dimension on cooling. The inside view in the picture cell shows the precise nature of the finished part: major diameter, the boss diameter and the precise geometric location of the sensor holes.